Words matter. The word “oblivious” is the focus of today's discussion. What brought this word to mind was a Speak Out letter to the Cadillac News from my friend Bernie Bovee. In the letter Bernie expressed his concern about “the pedestrian automobile challenge at Cadillac's major intersections.” I share Bernie's trepidation and have stated as much in previous columns. Within the last ten days I have witnessed examples in downtown Cadillac. I saw a car (driver's head down looking at a phone) blast through a red light at the Mitchell and Harris corner. At the intersection of Mitchell and Cass I observed a pickup truck run a red while making a left hand turn that caused traffic to halt. Another car disregarded a red light at Pine and Lake and made a left turn that required an oncoming car to slam on the brakes and skid to avoid a t-bone crash. Just last Wednesday at 2:12 PM I cringed as a pickup ran a red through fairly crowded mid-day traffic at Mitchell and Harris. On my daily walks, it's getting to be an oddity if I DON'T see a vehicle break the law. As a pedestrian, I see these situations on almost a daily basis. I call it the Oblivious Factor. 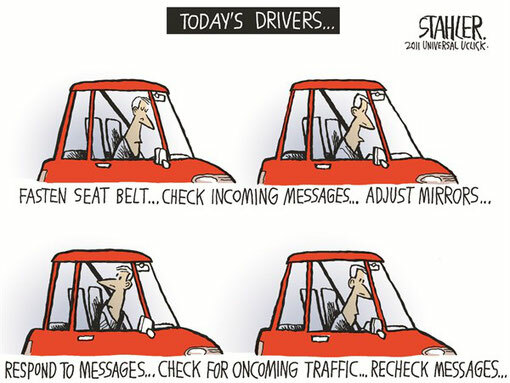 Dictionary.com defines “oblivious” as: “Lacking mindful attention or active conscious awareness.” These days, more than ever before, drivers are oblivious to the task at hand – driving a motor vehicle. I know what the problem is and I can prove it. The MSP says pedestrians should look left-right-left before crossing a street and continue looking while crossing, make eye contact with drivers prior to crossing in front of them, and never assume the vehicle driver can see you.” All well and good, but oblivious drivers void all common sense precautions by pedestrians. And things are about to get more complicated and potentially dangerous. “Until recently, there was no question about who’s responsible for an automobile’s operation: the driver. One-hundred percent. When driverless cars without a steering wheel or brake pedal start hitting the highway, your only role will be ordering the car where to go. Between now and then — about five years by automakers’ estimates — the relationship between drivers and their cars will enter uncharted and potentially hazardous territory. Humans and robots will share the wheel, and it’s uncertain how well people will adapt to this in-between state — whether they’ll remain appropriately vigilant or leave everything to the machine, possibly at their own peril. So, how does a pedestrian make eye contact with a robot? Is the self-driving car watching traffic or scanning for pedestrians at crosswalks? If a robotic vehicle hits a pedestrian, does the pedestrian take the robot to court? I have a feeling Bernie and I will have some interesting discussions as we ride the chairlifts at Caberfae Peaks this winter. Jim Neff is a local columnist. Read Neff Zoner columns online at CadillacNews.com and NeffZone.com/cadillacnews.